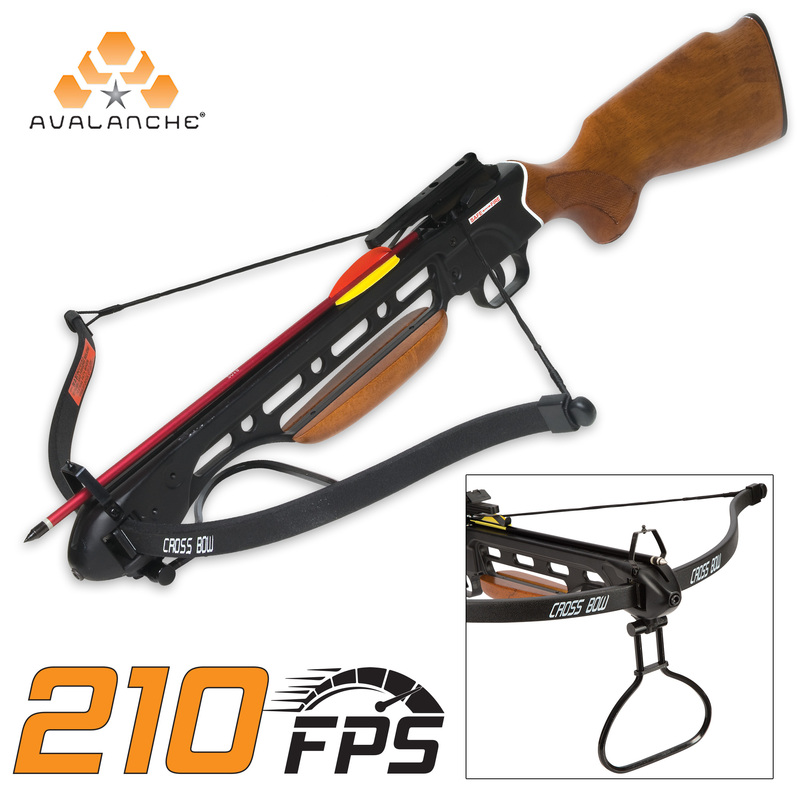 Avalanche Trail Blazer Crossbow Wooden Stock 150-lb | BUDK.com - Knives & Swords At The Lowest Prices! 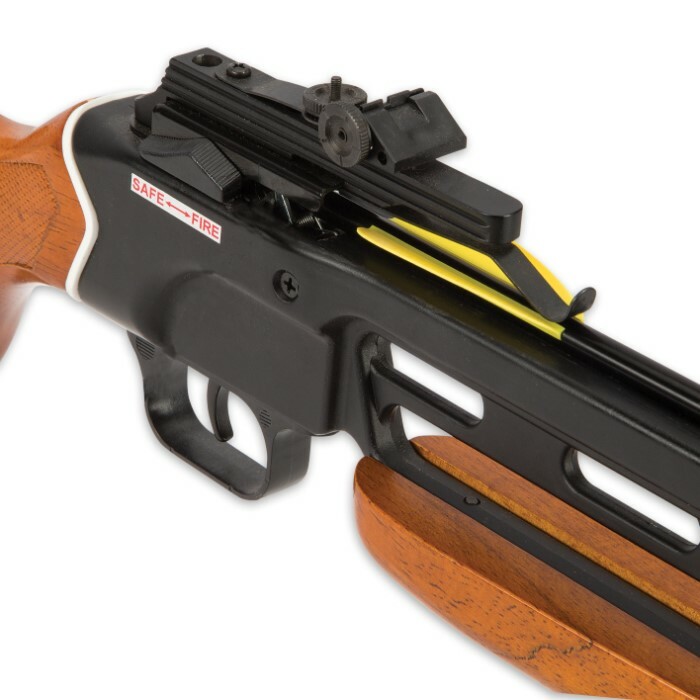 Offering optimum performance at a bottom-line price, the Avalanche Trail Blazer 150-lb Crossbow features a machined aluminum frame with a tough fiberglass limb and a wooden, rifle-style stock. The 11" power stroke with a 150-lb draw weight delivers arrow speeds of up to 210 feet per second with a 16" aluminum bolt. 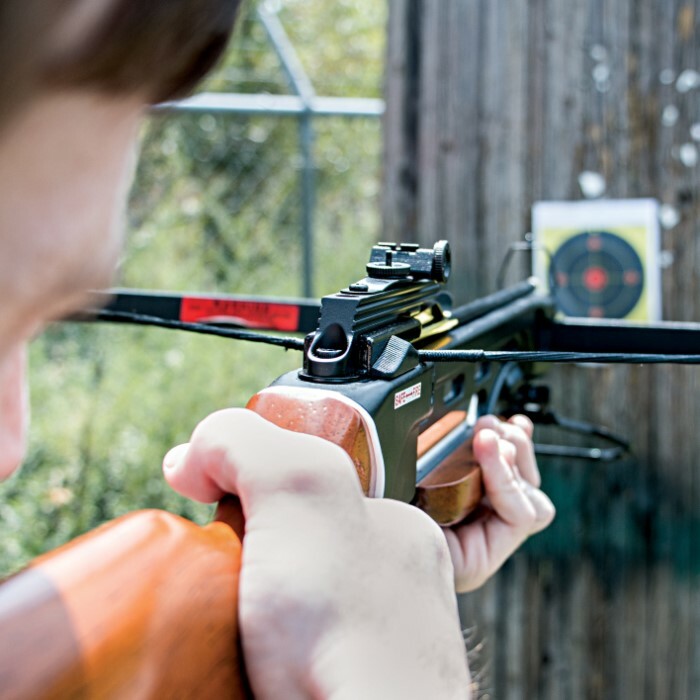 Hit your target with precision accuracy using the built-in adjustable sights. This crossbow also includes a mounting rail for adding a scope or red-dot sight. Includes two aluminum bolts. If you're anything like me, you can't stand all this "tacticool" sh*t, and would take a wood-stock rifle any day of the week. This crossbow is no exception, and is a gorgeous, classic looking crossbow in a sea of skeletal synthetic compound bows and crossbows. I really like it, but I had to get 20” carbon bolts for it because the bolts that came with it made it inaccurate- meaning it shot about 12” above the target due to the fact that they are a lot shorter. A very nice crossbow for the price. I wanted to buy a crossbow just for shooting targets and this crossbow is perfect for it. The only complaint I have is that it came with fairly useless instructions, other than that the bow itself is just great. I just put this bow together and i was very impressed with it. I love the wood stock on it ,and it makes the bow have class.I love to find new and different weapons to add to my arsenal (of wonderful toys),i just find this crossbow great. Iv'e shot it about five times and it has alot of power. I will let you know my findings on it,at a later time. For the price,this is a good crossbow. Ronn ''Manchu''Shaw. This is one awsome looking and functioning crossbow, i paid the sale price of 59.98 and it was the best 60 bucks i ever spent. I put an old crosman centerpoint 3x9x40 scope on it that is good anywhere between 5yrds out to 200yrds and i know with that scope i can take out anything out to 60yrds and not even worry about a miss. Also put a bipod on it just for more fun.I saw a reviewer state that a cocking rope does not work on this crossbow, that is totally wrong.The maker should have put the "groove" in place to make it easier to keep the rope in line but all you have to do is carefully place the rope where it belongs and tilt the crossbow at about a 30 degree angle towards your body and pull in such a way that your handles stay BELOW the rail. If you pull with the handles above the rail of course you will keep pulling the string out of the catch where it is supposed to be. If you do it the way i do you will never have a problem. Also, if you feel the need, you could just use a small round file and carefully form your own groove, just a little bit is enough and there is enough room on the piece to not do any damage. I also bought 20" carbon arrows and wow what a shooter this bow is. Keep the string waxed and rail lubed after every 20 shots or so and you are good to go. Could not ask for a better buy not to mention all the fun. Thanks budk i think i will buy another one. This is a lot of crossbow for the price, but make sure you use carbon arrows because this thing is way too powerful for the aluminum ones it comes with. Helpful hints: you need a stringer cable to string the bow.. I made one out of paracord, but it would be better to buy one. put electrical tape at the end of the limbs where the the string caps go, then put the caps over the taped portion, this will make them last longer. Then, twist the string four complete rotations to tighten up the strands, then wax it with bow wax or snowboard wax. I find the blue ski wax rated for colder temps to be best. Once the string is waxed up and twisted it should be rock solid. Get it strung, then take steel wool and polish the flight rail, mine had a few rough spots and the steel wool buffed it down to a smooth finish. Then take your wax and wax the flight rail (where the arrow sits) I would buff the inner rail as well so you dont hurt the arrow fletching. I was amazed at how well ski wax stayed on the rail without leaving residue. My string has lasted well over 100 shots and is still going strong with this method. Also, remove the front and rear sights and get a scope or a red dot on there. The receiver has an integrated dovetail (not weaver) mount so you can use dovetail rings or buy a dovetail to picatinny adapter. The sights on mine did not hold zero but i was planning on removing them anyway. This thing has tons of power and can be cocked by hand if you have a strong back and tactical gloves. Using my set up technique I am now hitting a tight group and have actually hit one arrow with another, shredding the nock. An Amazing item at this price point and capable of taking most game in America, large or small. Got one for my son-in-law and one for me. Lots of fun! You need to be a gorilla to get it strung, but after that the fun begins! Good quality, attractive wood. Can't go wrong buying this. This bow is amazing!!! Accurate and hits like a tank!!! I strongly recommend this bow, CHKADELS IS THE BEST!!!! My father taught me at 5 yrs old to use a bow and arrow Before a gun. I did the same For my daughters. I was injured in Iraq and I can only use a crossbow. My 17 yr old wanted a crossbow, so I got her this one, she loved it and perfected it enough that she asked to hunt opening day of bow season with it. She shot a 130lb doe 30 mins after getting on stand. 35' shot quartering away, lung/heart shot. Awesome for the price. The accuracy is similarly as close to my Ten Point.